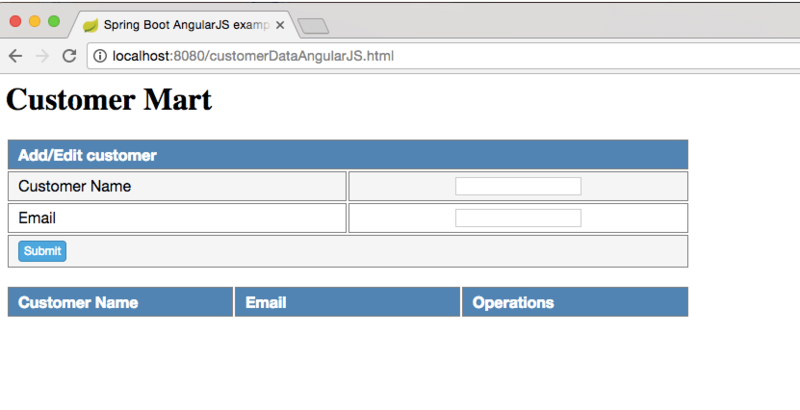 In this post, we are going to see how to create Spring boot AngularJS example. We will use Spring boot 1.5.3 Release version, it comes with hibernate 5. 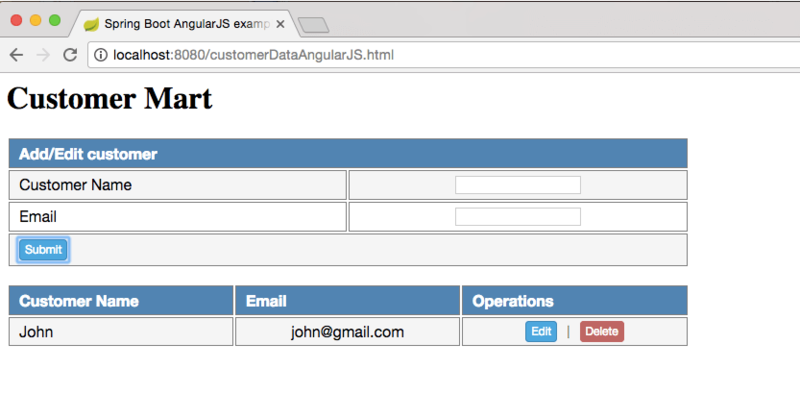 We will create a Spring boot AngularJS application which will have AngularJS as user interface. It will provide user interface from which you can add, update or delete customer database.We will use controller, services and DAO classes to achieve these functionalities.We will connect to MySQL database using SessionFactory class of hibernate. 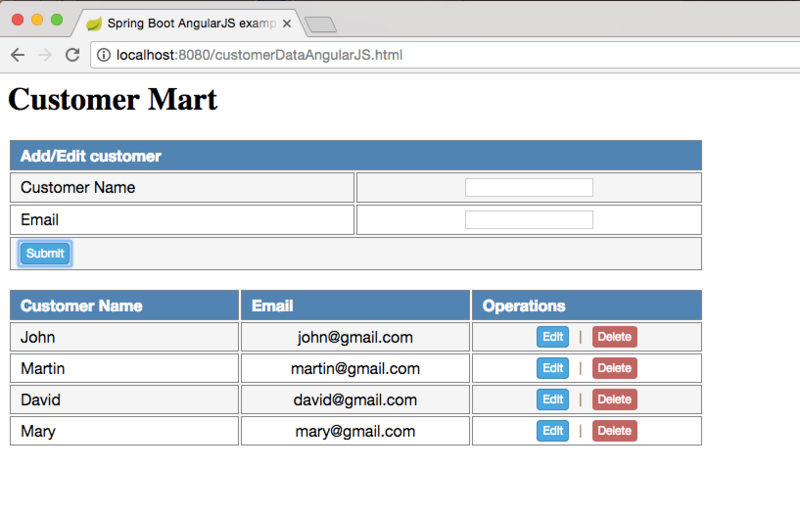 Here are steps to create a Spring boot AngularJS example. 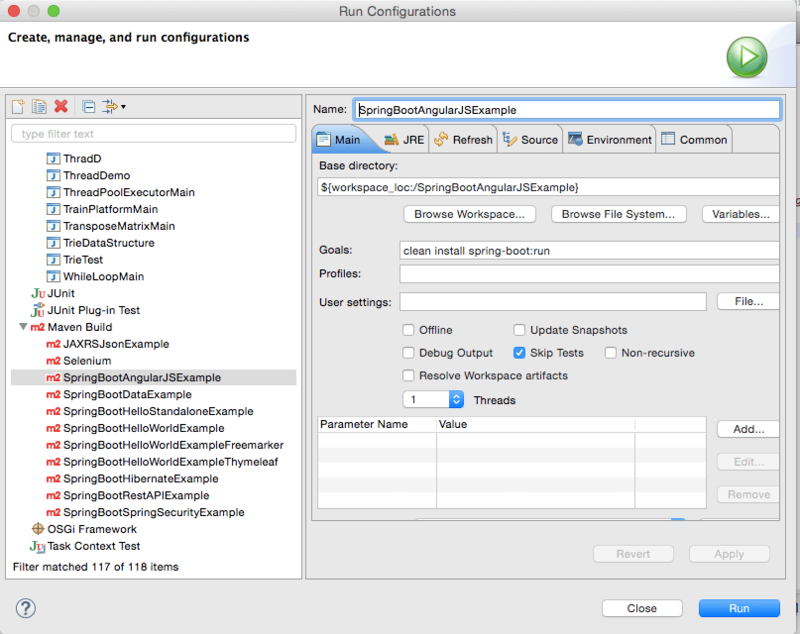 Step 1: Create a dynamic web project using maven in eclipse named “SpringBootAngularJSExample”. 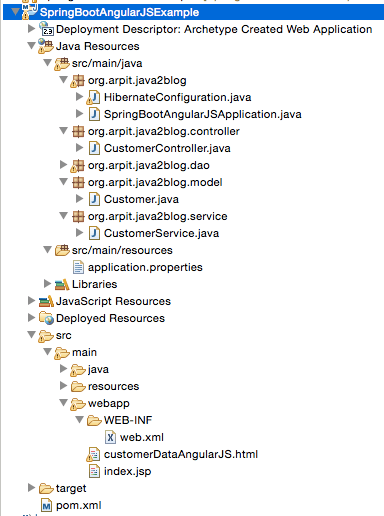 Since we are developing a web application, we also need to add spring-boot-starter-web dependency and also we need to include pring-boot-starter-data-jpa to run this application with hibernate.You need to also put mysql-connector-java for MySql JDBC driver.If you are using any other database, you need to use different database connector. Let’s do hibernate configuration first. Above class is annotated with @Configuration and @Bean annotation. These annotations are used to define bean in Spring. @Configuration is analogous to <beans> tag in Spring XML configuration and @Bean is analogous to <bean> tag. @Value annotation is used to inject variables from properties files. In this case, it will read from application.properties which we are going to create in next step. @Entity is used for making a persistent pojo class.For this java class,you will have corresponding table in database. @Column is used to map annotated attribute to corresponding column in table. 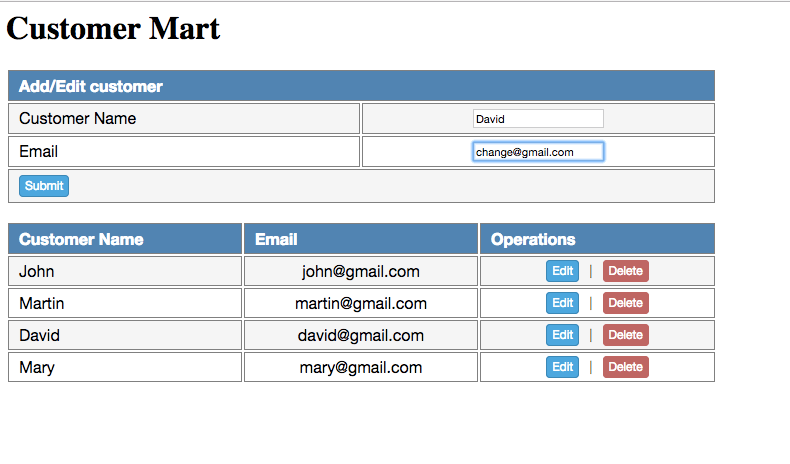 Create customer table in database with following DDL. Every time you submit data, it calls refereshCustomerData() to refresh Customer table below. Step 12: It ‘s time to do maven build. 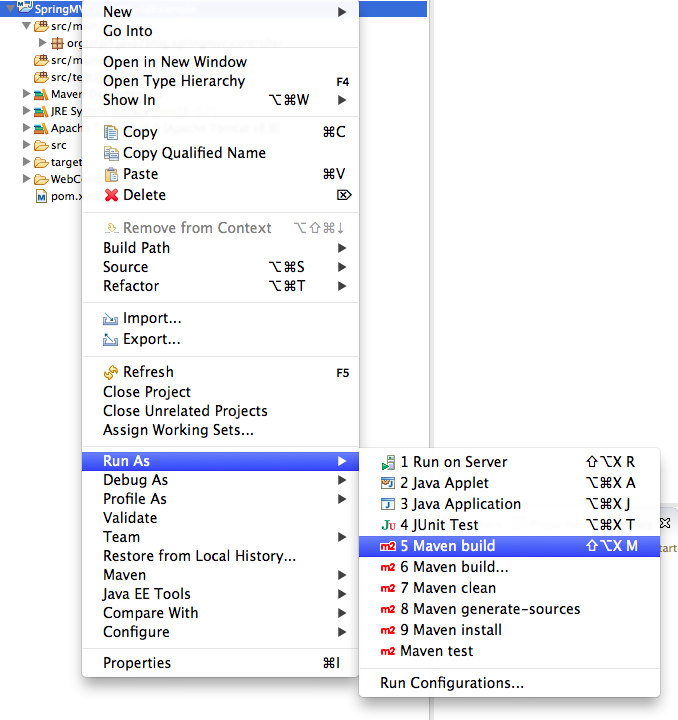 Step 14: Once you are done with Maven build, let’s go to the browser and put following URL. You will see below screen. Add follow details to Customer Name : as “John” and email as “John@gmail.com” and click on submit. Now I am adding more customers using above method. Let’s click on edit link corresponding to customer Id :3 whose name is David. When you click on submit, you will see below screen. As you can see David’s email address got changed to “change@gmail.com”. 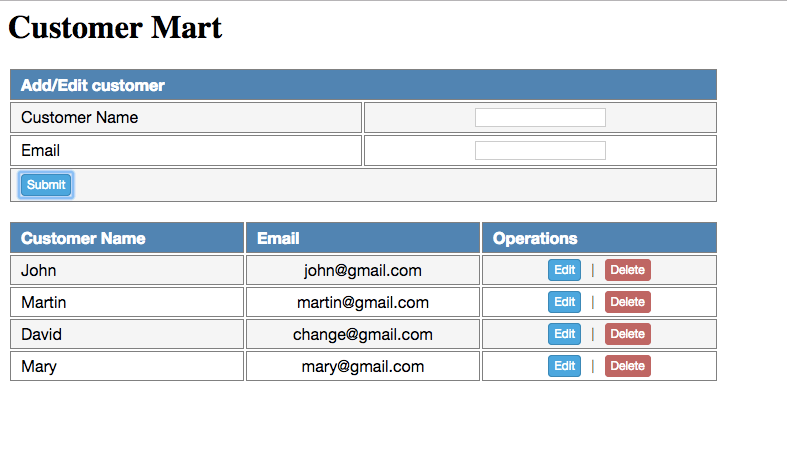 Let’s click on delete link corresponding to customer id :2 whose name is Martin and you will see below screen. As you can see, Martin got deleted from the list. 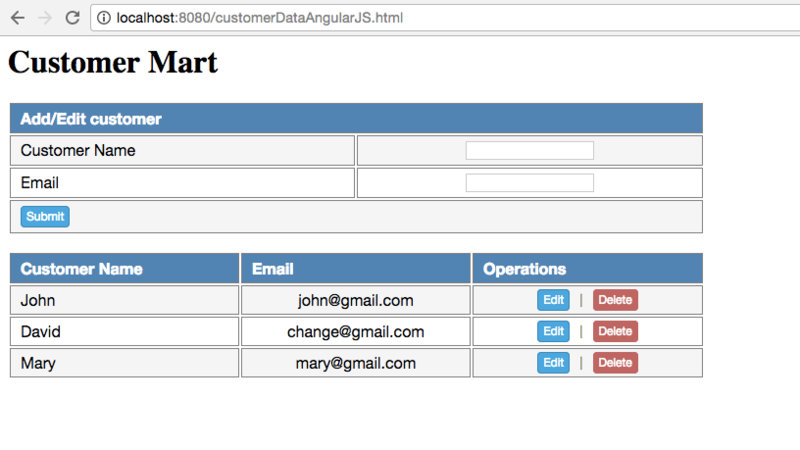 That’s all about Spring Boot AngularJS example.